My cat is a killer. He is sleek and stealthy and cunning from hard-earned meals of lizard, rat, snake, and field mouse. I have a new dog and I’m pretty sure the cat is going to kill the dog. I didn’t name him The Killer because he is a killer. I named him The Killer because I had just played a show with Jerry Lee Lewis. My Aunt Lou brought over a skinny gray rescue cat on a Sunday afternoon. “Where the hell have you been all weekend?” she said. “I was playing a show with The Killer,” I said. I love the cat. I love animals that are good at their job. For an animal to be truly happy, it must be allowed to express its innate instinctual desire. All animals have a passion, a calling, to do something—it is the core of their nature. Chickens want to scratch in the field; pigs want to root in the forest. Successful animals are allowed to fulfill their instinctual desire to the highest level. My cat’s desire is to kill. Did I mention hummingbirds? My farm was a host home for the Rockport Hummingbird Festival this year. I have several large gardens of beautiful flowering native plants. My gardens were overwhelmed with hummingbirds. The ladies of the Rockport Hummingbird Association came out to inspect my property before the festival. They were thrilled with my gardens and the swarms of hummingbirds like sparks among the flowers. Suddenly my cat leaped out of a flame acanthus, about four feet into the air, and caught a hummingbird on the ascent. He ate it in four bites. Then the cat dove into a pride of Barbados flower and body-slammed another bird. “Oh my! 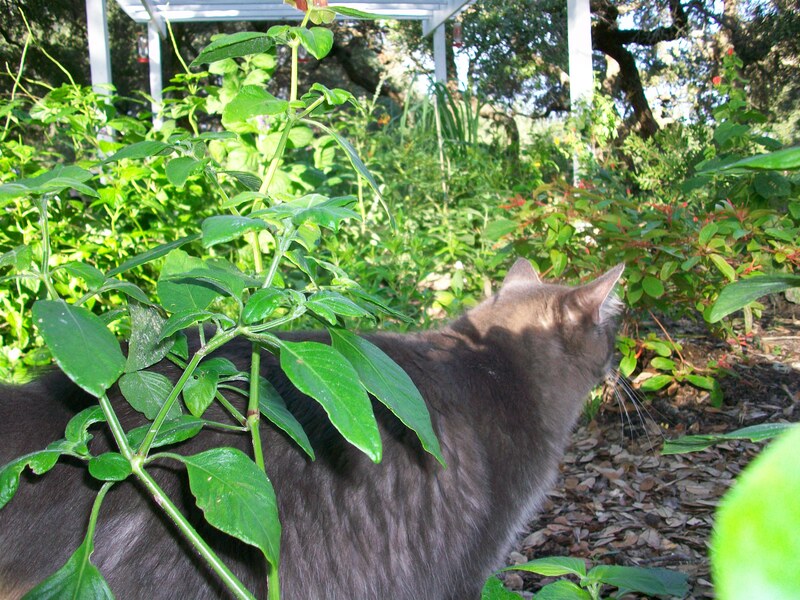 Your cat is eating all the poor hummingbirds!” the president of the Hummingbird Association said. Later, as the Hummingbird Association trooped out to their mini-van, The Killer was lying on his back next to the garden. He had a huge distended belly and a hummingbird in his front claws. I don’t think I have a shot at the festival next year. Back to Jerry Lee Lewis. The booking agent from Austin called and said, “Hey, do you guys want to open for Jerry Lee Lewis?” All I could think is: Is Jerry Lee Lewis still alive? Yes, he is very much alive. 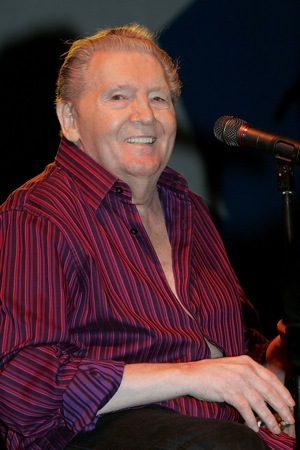 We warmed up the crowd for Jerry Lee and I was amazed at how many people were there. While we were playing, I recognized several famous musicians in the audience who were watching us and waiting for Jerry Lee Lewis. Jerry Lee uses a walker. He shuffled on his walker from the tour bus up to the edge of the stage. Then he dramatically kicked away the walker and crossed the stage on his own. It took him almost two m inutes to get to the piano. The audience cheered him the whole way. He sat down and pulled the microphone to his face and said, “They call me The Killer!” and started pounding on the piano keys. He played the most rocking show you’ve ever seen. The crowd was wild. This guy is 74 years old and when the music started he lit the place up with energy. It was an absolute joy to watch a master doing what he was born to do. 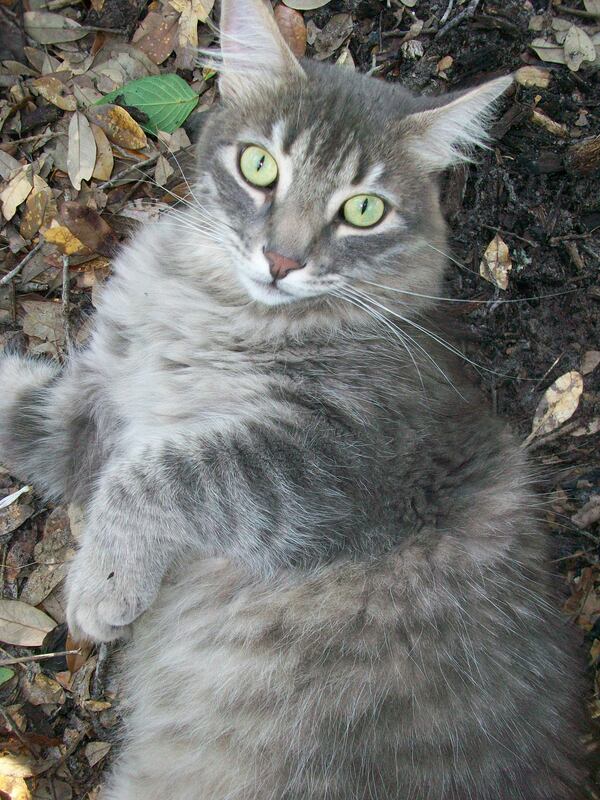 I got home the next day and Aunt Lou gave me a scrappy gray cat with green eyes. I named my cat The Killer and I wish him a long and happy life doing what he does best. 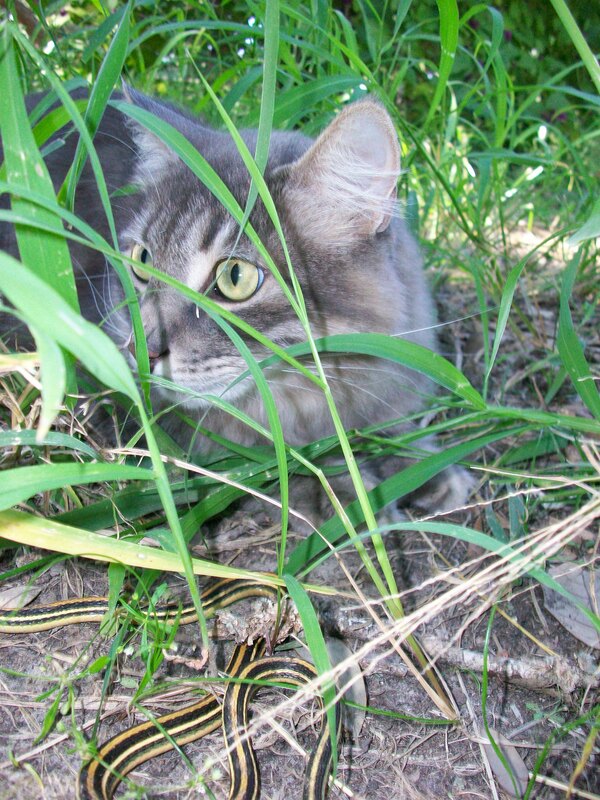 We rescued a cat from a local shelter who has turned out to be a fabulous hunter… no worries about mice in OUR house. She also likes lizards, roaches, and birds (when the latter get in the house). quite a girl, the most useful cat we’ve ever had.